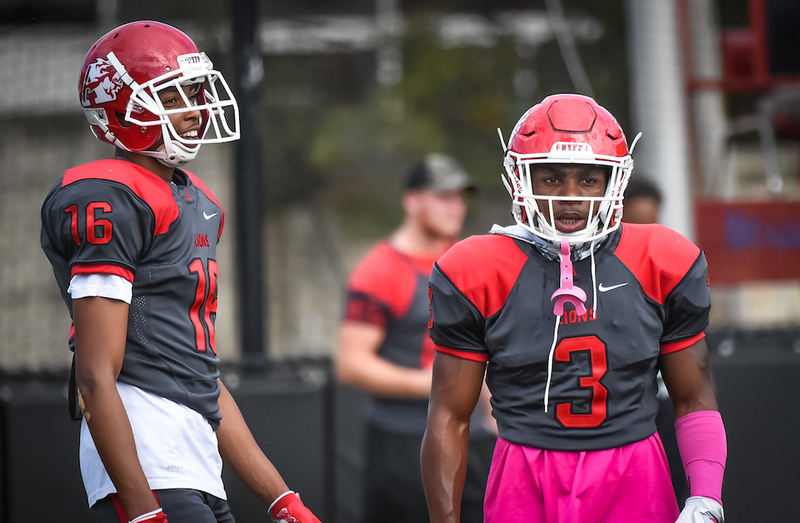 MADISON, N.J. – The Albright football team scored a season-high 51 points as it defeated FDU-Florham, 51-33, on Friday night at Robert Shields Field. Quarterback Alec Vignola completed 19-of-27 passes for 281 yards and three touchdowns. Vignola threw his three touchdown passes in succession, all happening within a span just over four minutes. FDU-Florham had just cut the Albright lead to 20-7 with a three-yard touchdown pass from Mike Panzarino to Malik Pressley with 11:01 left in the second quarter. Both teams followed that score with two punts apiece. The second of those FDU-Florham punts set the Lions up at the FDU-Florham 47. Vignola completed three passes on the drive – the only plays of the drive – culminating with an eight-yard strike to Khari Jefferson to make it 27-7. Albright scored quickly on its opening possession of the second half. Vignola again needed just three plays, and this time the drive went 71 yards in just 1:01. He hit Kyle Dickerson for a 44-yard touchdown pass to make it 34-7. That was Dickerson's second touchdown of the game. He made it 14-0 Albright on an 80-yard punt return with 9:14 remaining in the first quarter. The Lions opened the scoring on a four-yard touchdown pass from Jimmy Lahay to Malik Jackson just a couple minutes earlier. Following Dickerson's touchdown reception that made it 34-7, David Sanchez intercepted a pass on the Devils' second play of the drive to set up the offense at the FDU-Florham 35. This time, Vignola capped a two-play drive with a 23-yard touchdown pass to Milton Cordero to make it 41-7 with 12:22 left in the third quarter. Nigel Sealey added a four-yard touchdown run later in the third quarter to make it 48-13 Albright, and Kevin Goetz kicked his third field goal in three tries to round out the Albright scoring midway through the fourth quarter. FDU-Florham scored three touchdowns in the final 19 minutes, but the result was never in doubt. Sealey finished with nine carries for 43 yards, averaging nearly five yards per carry to go along with his score. Jackson and Dickerson led the Lions with six catches apiece. Jackson had a team-high 96 yards while Dickerson finished with 91. Mike Jordan wasn't one of the four Lions' receivers with a touchdown, but he finished third in both catches and yards with his four grabs for 85 yards. Cordero also had four catches for 75 yards. Besides his interception, Sanchez finished with two sacks and seven tackles. Isaiah Baylor had another huge game on the defensive line. He finished with a team-best 11 tackles, two forced fumbles, 3.5 tackles for loss and a sack. Grant Boehler and Nate Steffen each had nine tackles. Albright returns to action next Saturday at home against Lebanon Valley at 1 p.m.